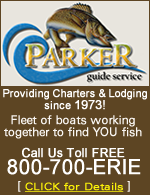 This is a free service provided to surfers who desire to reduce the labor involved in searching out Lake Erie charter services matching specific search criteria. This website, the owners (Awesome WebSite Marketing), their employees and assignees do not endorse any of the charter services within the index. Each charter service is a separate entity and must provide the prospective customer with any and all services, insurances, safety equipment, documentation, etc. for the booked charter. By using this index you understand and agree to hold this website, the owners (Awesome WebSite Marketing), their employees and assignees completely and totally harmless of any mis-understandings, legal actions, refund requests, etc. between you (the customer) and the charter service you may have found using this free website. 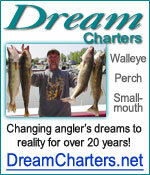 The information contained within this website was verified at the time it was collected, however it is the nature of the charter fishing business for this information to change and you may find that some or all of the information is incorrect. By your continued use of this website you acknowledge that the information contained within may be flawed, incorrect or otherwise unavailable. You also acknowledge that this website, the owners (Awesome WebSite Marketing), their employees and assignees have tried their best to provide accurate and up to date information but at times may fail to do so and furthermore you agree not to hold them completely and totally harmless of any mis-understandings, legal actions, etc. It is further understood and agreed that when you provide information to us (Awesome WebSite Marketing) such as your phone number, mailing address or email address you give us permission to include you in an future mailing and or promotions via these three mediums. We agree to never provide this personal information to third parties and never to use this information other than within promotions directed about or from this website. All promotions we deliver will always have an opt-out feature providing you a way to eliminate your inclusion in future promotions.